Lexan is a brand name and not the name of the material itself, polycarbonate resin thermoplastic is what it's more commonly referred to as. In a nutshell, Lexan is that it’s a solid substance that can deform in extreme heat is exhibit excellent toughness, high impact strength, and a high modulus of elasticity. Most types of Lexan thermoplastic offer transparency and high optical clarity. 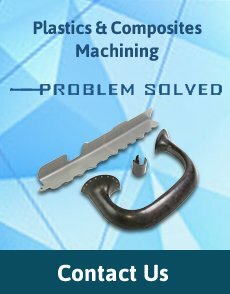 This material is relatively easy to work with, and Upland Fab are experts in machining complex, high precision parts from Lexan polymers. Lexan thermoplastic provides high heat deflection, very low moisture absorption, favorable low frequency and high voltage insulating characteristics, making it an ideal material for electrical and electronic components. Lexan also provide high tensile, shear, and flexural strength, and boasts an impact strength of 250 times greater than that of glass and 30 times greater than that of acrylic. Excellent creep resistance and flow resistance, a low coefficient of thermal expansion, and low deformation characteristics under load further improve the materials’ performance in high temp applications. Lexan polymers are highly versatile materials that are useful for a broad range of applications. Common uses for Lexan include equipment housings, electrical connectors, insulators, and fittings, relay components, medical devices, and many more. Sheet grade Lexan is also called Lexan (GE) or Makrolon (Bayer) whereas acrylic sheet Lexan is commonly referred to as Lucite. Both Lexan and Lucite have benefits and drawbacks. Both are two of the most frequently used see-through plastics but Acrylic will have a shinier surface but is easier to crack. Where Lexan / polycarbonate is stronger and more impact resistant it's also easier to scratch. There are many grades of Lexan polycarbonate thermoplastic available, from general purpose to machine grade to glass-filled and more. Each grade offers unique characteristics that may make it better suited to your application than others. Contact us to discuss your material requirements. When working with Lexan, Upland Fab utilizes multi-axis machining to ensure that tight tolerances are maintained from the first part to the last. Our CNC machining capabilities enable us to produce consistently high precision parts, with minimal handling and fixturing requirements. In many cases, even the most complex parts can be completed in a single operation for fast turnarounds. Thanks to our DPD/MBD processes (Digital Product Definition/Model-Based Definition), we can work directly from your completed CAD models. Working straight from your digital design files eliminates manufacturing errors and ensures that your parts match your exact requirements. We can deliver cost-effective Lexan thermoplastic parts that are 100% on spec. With Upland Fab, you’ll have a single point of contact throughout every stage of your project. We know the importance of effective communication, and we’ll provide reliable, consistent updates to keep you informed from the first step to the last. Upland Fab has been providing top-flight plastic and composite machining in Southern California since 1970. Contact Upland Fab to discuss Lexan thermoplastic machining for your project, or request a quote to get started.